Weave got an interesting read here: How to create soft cloth-like bodies using Babylon's new physics architecture. After making the changes to the physics engine architecture in Babylon.js, I added a new impostor type, influenced by Cannon's wonderful impostors implementations—the Particle Impostor. The Particle is a very simple impostor. It can be compared to a point in space so it reduces the need for heavy calculations when checking for collisions—it is a point-to-body kind of collision, which is much simpler to calculate. Cannon's cloth demo (http://schteppe.github.io/cannon.js/examples/threejs_cloth.html) is showing the power of particles. My implementation of them (and the integration in Babylon's architecture itself) was influenced heavily by this implementation. With a big thanks to Schteppe, the creator of the wonderful Cannon.js—the physics engine I will mainly use in this tutorial. In this tutorial/blog post/infomercial, I will recreate Cannon's cloth demo using Babylon. Physics engines (at least the ones integrated in Babylon.js) relay on a very important characteristic of an object—rigidity. That means, in general, that the physics body is not elastic. It doesn't change during the entire scene's life. A sphere will always have the same radius. A box will always have the same dimensions. If you do change the object's parameters (mainly size, but also position vertices in case of a mesh impostor), you will have to create a new (rigid!) body for this object. So, if we create a ground object (a flat plane with predefined dimensions) and register its impostor (thus creating its physics body), the physics engine will always treat it as a very narrow box that cannot be changed. The bottom line is that you cannot use a single impostor to create soft bodies, like a cloth. Those four spheres in the corners will simulate our soft body. 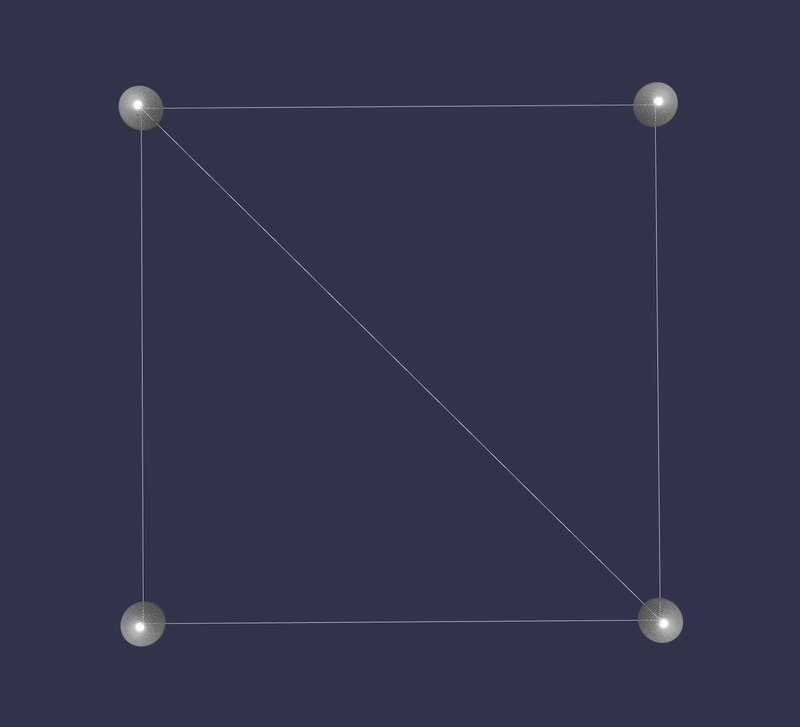 The theory is this: If we keep on updating the square's position vertices using the position of those 4 corners, we can create a "stretching" effect if we move the spheres individually. You can see what I mean in this playground: http://www.babylonjs-playground.com/#1J3WEP. Go, watch, and come back for explanations. Back, yet? Great. What did I do there? Notice that I am taking the raw positions and converting them to vector3 objects. If you transform the ground, those vectors must be transformed as well (using BABYLON.Vector3.TransformCoordinates(...)). I won't cover it here, but I will be more than happy to explain how it works. Now changing each sphere's position will stretch the ground in many ways. Here is a playground: http://www.babylonjs-playground.com/#1J3WEP#2. Go check it out and come back, then we'll continue. Ok, now we know how to "soften" a hard mesh. We just change its positions vertex-data. But, how do we use it with our physics engine? Each sphere we saw before will act as an individual impostor. A particle impostor. These (rigid) impostors, will help us get a physics-enabled soft body, like a cloth. To do that I will use the DistanceJoint which is a joint connecting two physics objects with a predefined distance between them. The physics engine will keep the distance between those objects. First, I connect vertically—I start from the second row and connect it with the row above it. Then I connect horizontally—except for the first impostor in each row, I connect each with the impostor before it. Now, we have a cloth. We can do so much with it! Yes! Babylon.js will soon have a new physics extension called "physics bodies" that will hold implementations of common physics bodies. The cloth will be there. There will also be some car implementations and other cool things. Babylon's physics architecture's main goal is to unify all physics engines to one single API. In a perfect world, this means that changing the physics engine to Oimo instead of Cannon should work out of the box. And, we just found out it isn't a perfect world. Oimo's distance joint works a bit differently than Cannon's, and the connections look a bit "stretched". Oimo is also much faster (being much simpler than Cannon), so the fabric will "vibrate" very fast. First, the distance between the two joints should be kept to a minimum. Setting the distance to 0.1 will prevent the stretching. The solution to the "vibrations" is to reduce the time step. Which means "slowing down" the physics engine. Just one important thing, Oimo doesn't have a particle impostor. 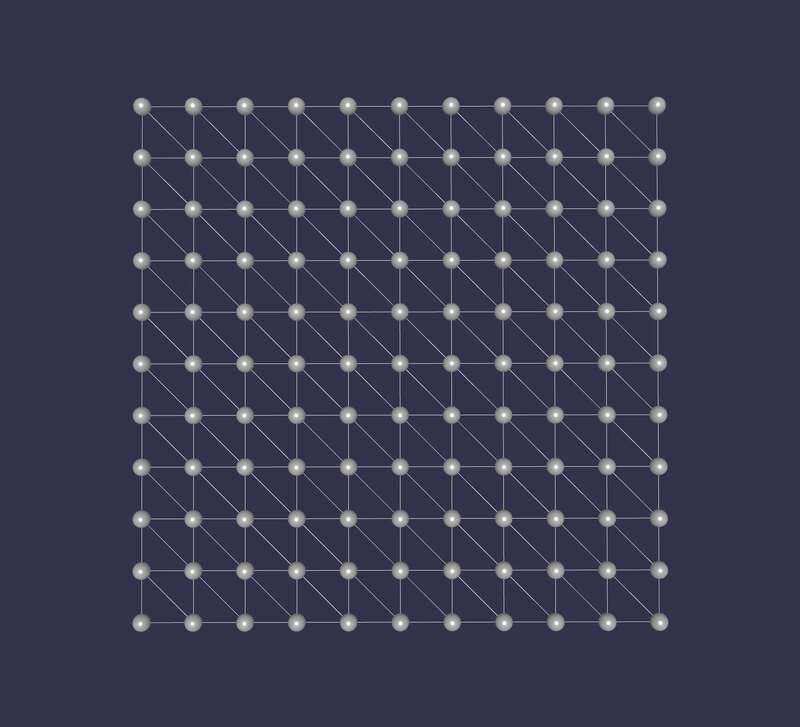 This is emulated using a very small sphere, which has its downsides. Play around with this implementation, try it out. Ask me any questions you have. Once the Babylon physics body library isfinished, I will publish the full implementation, including transformation adjustments and other types of meshes. But, that shouldn't stop you from experimenting.